My students LOVE to play Cariboo! This can be used as an open ended therapy game. For example students roll a dice and say their sound the number of times on the dice. 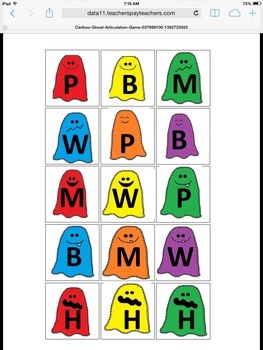 They can also pick words from a bag and after they student says the word, they can locate and open a corresponding door. I’ve included cards for early founds /p,m,h,w/ and for /k,g/. I’ve also included a blank colored set so you can add in your own sounds. Cards are sized for the square version of the game.